Some of the most fun things to do in a tropical destination are scuba diving or snorkeling. There’s a whole world of colorful creatures just below the water’s surface to explore. It’s a great way to cool off while seeing things that you’ve never seen before. Unfortunately, the task is a bit more difficult for those of us who wear glasses. In fact, many guys who need glasses will scuba dive and lose a bit of the experience because they are unable to truly see the beauty before them. Scuba diving and snorkeling is about seeing and experiencing a whole new ecosystem. What fun is it if you can’t actually see? Luckily, there are actually ways to get prescription masks. 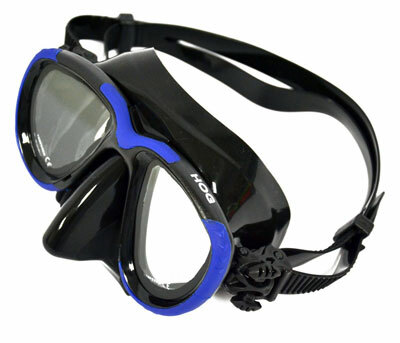 Normal masks help divers and snorkelers see clearly by blocking out water. While most guys don’t give it a second thought, there are actually a number of options available, including prescription strength masks to help anyone see clearly. There are a few things to consider before buying a prescription mask. First of all, will you be using it often? In some cases, prescription masks can cost a few hundred dollars. It’s just not financially smart to go all out on mask that you’ll only be using once. Secondly, guys should think about how much they are willing to spend. These masks can range from around $50 to upwards of $300. Obviously, price often reflects quality, so guys should think about where they want to put their money into. Finally, guys should think about what type of prescription mask they want. There are a few options, all of which have great benefits. Guys can choose to get bonded, custom, and drop in lens masks. 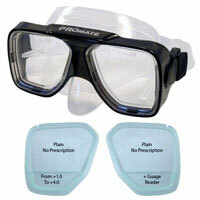 Bonded lenses are a great option to take a prescription lens with you under water. Essentially, they are normal masks that have the prescription lenses glued to them. Your prescription will be used to create lenses that are roughly the shape of the mask. They are then glued directly to the mask. It is a mid range price option, yet it does have a few disadvantages. In most cases, the lenses aren’t cut exactly to the shape of the mask, limiting the field of view. Also, it adds a lot of weight to the mask. This can make the experience uncomfortable rather than tranquil. Overall, it’s a good option that doesn’t cost as much as custom masks. Custom lenses are perfect for someone who will regularly use them. They are at the higher end of the price spectrum, but they provide the best view possible. Instead of creating separate lenses that are glues to the mask, a single piece of glass is crafted to the desired prescription. The end result will look like a normal mask. There will be no added weight, and you’ll have full view of the ocean in front of you. These can also be made of a high quality plastic lens rather than glass to reduce weight. These masks are one of the most cost effective options. Additionally, they work fantastically. Instead of getting custom made masks, these masks contain lenses that can be easily removed. Those who know their prescription can easily get drop in lenses without having to get them custom made. They can simply pop into the mask to provide complete visibility and a water tight seal. It may not be a viable option for those who have complicated prescriptions or astigmatism. However, to most eyeglass wearers, this option can help save money without having to sacrifice quality. It’s great for occasional users or everyday use. If you already own a compatible mask, you can save even more money by simply ordering the lenses. This mask is a great option for anyone. They are drop in lens masks that come in a number of different colors and lens types. They can be ordered with the prescription lens already installed and ready for use. At around $60, they are affordable, yet superb in quality. It’s an economical option for guys who want to get an awesome mask that won’t break the bank. Divers and snorkelers have a lot of lens options. They have options for both near sighted and far sighted people. Prescription options range from -1.0 to -10.0 and +1.0 to +10.0 respectively. The options go in .5 increments.Those with .25 or .75 prescriptions should order a lens that rounds down. This will still give you improved vision without having to strain. There’s also a bifocal option. The upper part of the lens is plain for distant viewing while the lower portion is customizable for close up viewing. It gives even the most finicky eyes the comfort and viewing ability they need for you to enjoy the experience. You can even get a separate prescription strength for each lens, making it accessible to most eyeglass wearers. Those ordering the mask will need to message the seller when they place the order to ensure that they will install the lenses appropriately. The lenses themselves will be installed by a technician before they even ship, so you won’t have to worry about fumbling with lenses. The lenses are made with durability in mind. They’ll be used in tough environments, so they are made of high quality material. They are made from tempered glass to ensure durability and safety. Unlike traditional lenses, the glass is treated with heat and chemicals. This toughens the glass by compressing the outer surface and causing tension on the inner surface. Ultimately, this balances the stress caused by the water pressure. They are incredibly strong and resistant to scratches, allowing them to be used in even the harshest waters. Should they break, they’ll shatter into smaller granules. 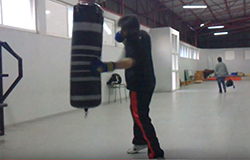 This is less likely to cause injury. Who doesn’t like to be stylish? These masks come in 9 different colors, making it incredibly easy to get one that compliments a diving suit. You could get a neutral color to blend in with the surroundings or a more neon color for increased visibility to others. 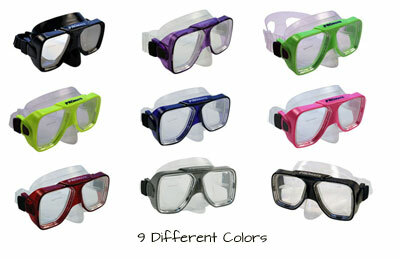 With the ability to change the lenses, you could easily get multiple colors. When it comes to masks, the other parts are just as important as the actual lenses. The skirt and straps are made from crystal, injected silicone. This makes them incredibly pliable and comfortable. In fact, it has a double edge comfort seal that conforms to the face seamlessly to block out water. It’ll help to keep the mask water tight and safe. Ultimately, this mask is a great option all around. Divers and snorkelers can get a quality mask that will withstand anything it is used for while still getting the ability to see clearly. The customizable lenses will allow most eyeglass wearers to enjoy the experience comfortably. On top of all of that, this mask is incredibly affordable! You can get a mask without breaking the bank while still getting a high quality product that will last through many adventures.